A summer visitor to Britain, the Common Sandpiper (often referred to simply as the Sandpiper) breeds mainly in the hills. Its characteristic nodding stance with bobbing hind quarters make it easily identifiable. This wader, 18 to 20cm in length and with a wingspan of nearly 40cm, has a relatively short (2 to 3cm) bill. Sandpipers love small, clear streams and upland lakes where they can feed on freshwater shrimps and other crustaceans, insect larvae and worms. Most often seen singly or in pairs, common sandpipers generally forage away from congregations of other birds. They nest among vegetation on the ground, usually in forests and nearly always close to the water's edge, producing typically four young. As soon as their down is dry after hatching, the young sandpipers run around and are able to feed themselves, although the adults will accompany them. 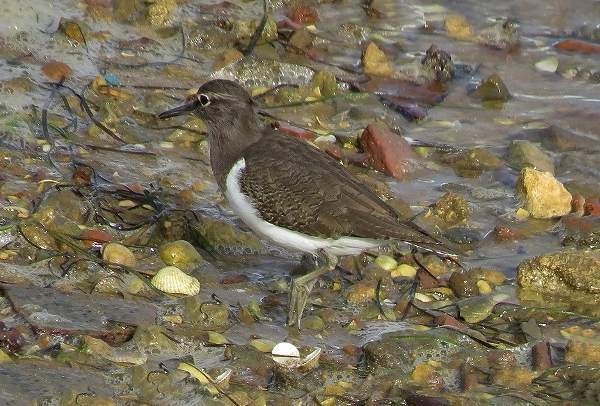 Common Sandpipers arrive in Britain in April and May, returning to Africa (occasionally southern Europe) for our winter months. This page includes pictures kindly contributed by John Foss.